Fayette Town Center is located on US 19 at a signalized intersection. 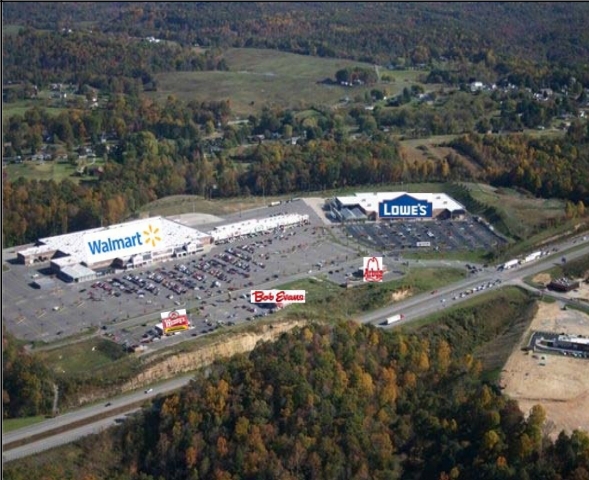 The center is anchored by a Wal-Mart and Lowe’s Home Improvement. U.S. 19 has a traffic count of approximately 21,000 cars per day, and is a major corridor for travelers connecting three interstate highways: I-79, I-64, and I-77. In addition to this area’s solid demographics, Fayetteville has a high volume of tourist and visitor traffic, with over 1 million visitors to the New River Gorge National Park annually. The whitewater rafting industry draws 250,000 visitors to the New River each year, and the Gauley River draws more than 130,000 visitors.